As of 2004, Cyber Security Awareness Month has been celebrated in October. 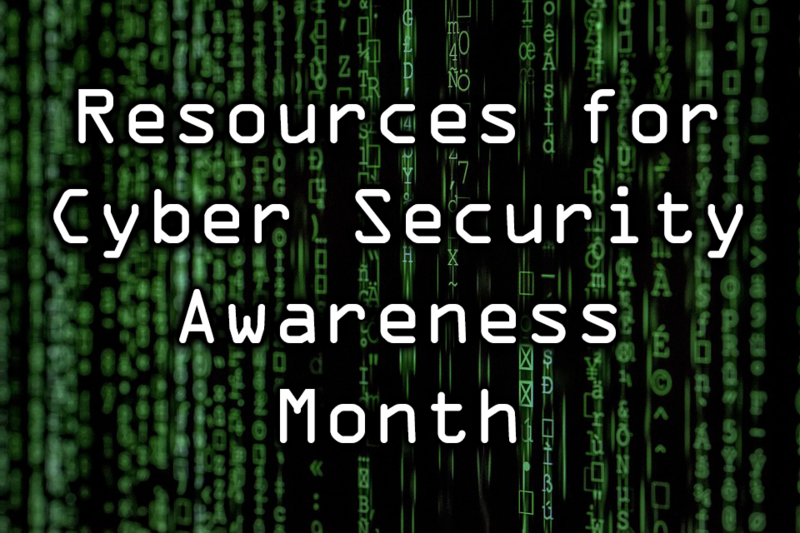 This month is sponsored by a division within Homeland Security (the National Cyber Security Division) and the National Cyber Security Alliance. The goal is to encourage all technology users to be more aware of risks and potential online threats which typically target human behavior. You may notice various posts and updates this month across your devices and tools as it relates to cyber security. For example, you may have noticed the Presidential Alert on your cell phone on Wednesday, October 3. Though that alert is to warn of a more widespread disaster, it wasn’t a coincidence that it took place this month. To help you participate, we’ve collected resources, ideas, and activities that can be implemented and shared with students (and teachers). 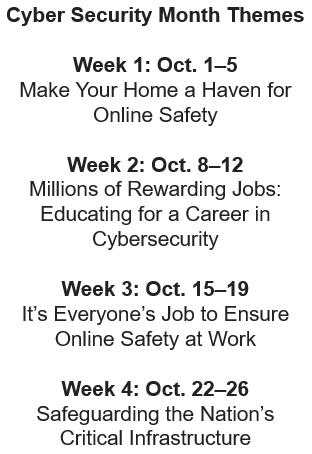 Weekly Security Themes – The National Cyber Security Alliance has identified a theme for each week of this month in order to bring more awareness to specific aspects of online threats to consumers, educators/students, and businesses. FBI Resources for Weekly Security Themes – In conjunction with the NCSA, the FBI has provided specific resources to help educate yourself and students. CISCO Resources for Weekly Security Themes – CISCO has organized resources that provide more in-depth, relevant information for each week covering topics such as Machine Learning 101 and Data Protection and Privacy. Science and Technology’s Cyber Security Division Overview Video [4:55] This video shares the major tasks of the Cyber Security Division and how this division brings together government departments and private sector organizations to develop innovative technologies and safer procedures. CyberSmart! Classroom Activities & Posters – The NCSA partnered with McAfee to distribute free cyber security posters along with accompanying activities to educators. Even if you aren’t able to incorporate the activities this month, consider using them at another time during the year as you discuss various aspects of digital citizenship. GenCyber Teacher Camp Resources – The University of Tulsa has organized a GREAT list of lesson plans, units, activities, and resources for educators. Be sure to explore and share with others! Cybersecurity Lab – Teens will find this a fascinating and intriguing game to play as they learn what fosters authentic scientific exploration. The four major gameplay components consist of Coding Challenge, Password-Cracking Challenge, Social Engineering Challenge, and Network Attacks. CERIAS Lesson Plans and Presentations – The Center for Education and Research in Information Assurance and Security (CERIAS) has gathered and organized an excellent list of lesson plans for educators. The categories of lesson plans include lesson plans for all grade levels, lesson plans for K-5, and lesson plans for 6-12.
eGFI Lessons and Activities – The Engineering, Go For It (eGFI) organization has put together several activities that you’ll enjoy sharing with your students. Along with the activities is a list of related lesson plans! NICCS Resources for Engaging Students in Cybersecurity – The National Initiative for Cybersecurity Careers and Studies (a part of the Department of Homeland Security) has put together a helpful guide to lead educators in bringing awareness of careers in the cybersecurity field. Winning the Cyber Security Game – If you are a middle school teacher, you’ll enjoy using this lesson plan with your students. Canadian educators will appreciate that it is aligned to the Digital Literacy Framework for Canadian Schools. Anticipate the activity taking one hour for 5th and 6th grade students and up to three hours for 7th and 8th grade students. Free Resources for Teaching Students Cyber Security – Orion Technologies provided an “ultimate list” of resources for teachers. To better assist you in finding the perfect resources, they have divided them into the following groups: for teachers, for administrators, for younger kids, for pre-teen and middle school kids, and for older kids. Cyber-Security Starter Activities – STEM Learning provides two starter activities to help get you started with educating students age 14 to 19 in aspects of cyber security. Unplugged Activities – Did you realize you can teach cyber security concepts without the Internet?! Bits N’ Bytes by Kyla provides you with a lesson plan for 4th through 8th grade students that will take up to two hours to complete. If you would like to search for more ideas and resources, consider doing a Google search using this as your search query [ cybersecurity site:.gov ]. This query (without the square brackets) will limit your search results to websites that have the .gov domain. If you want to search for information provided by universities, then change the .gov to .edu. Here are the search results for each: using .gov and using .edu.